E3 2010 has just rolled out of the gate! People are streaming in to check out all of the cool games we’ve got going on and it got pretty crowded pretty fast. Before the show floor opened this morning, I snapped (and tweeted) some pics of our booth setup. Here’s a more thorough tour of where we’ll be spending the next 3 days. This is what you see when you approach the booth from the front — our front desk underneath a massive video wall. Trailers for the games we’re showing off will be playing here, and I can tell you that this photo doesn’t do it justice. It’s huge, high-def, and amazing. Heading to the right from the desk, you’ll see this Shogun 2 chap on your left. 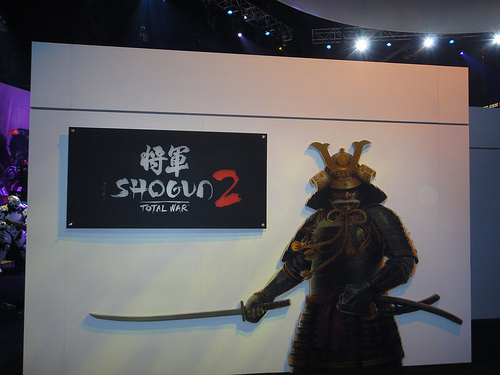 Shogun is being shown off in a private room, so people can sit down and really immerse themselves in the demo of the game. From there, a slight turn to the right greets you with some familiar faces – Sonic and Jet. 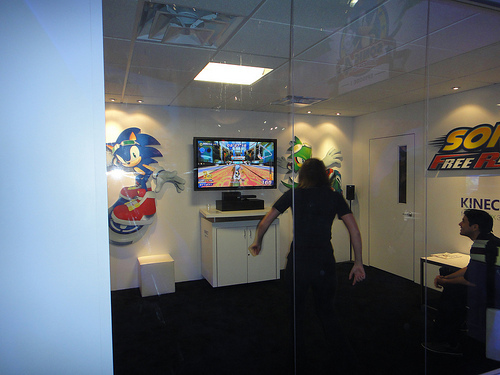 This is the room where Sonic Free Riders is being shown off. The game is being demoed in a semi see-through room, so you can watch the player twist, jump, throw, and lean to interact with the game. 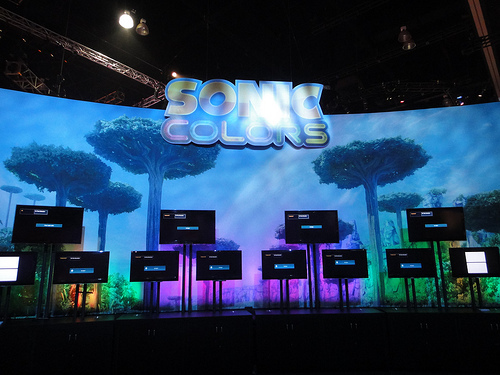 If you did a 180 turn from the Sonic Free Riders demo area, you’d be staring at Sonic Colors. Obviously, this photo was taken while we were still setting up, but the game is now running on these monitors and looking fantastic. Another 180 turn and a slight shift to the right brings you to the Sonic the Hedgehog 4 Episode I lounge. 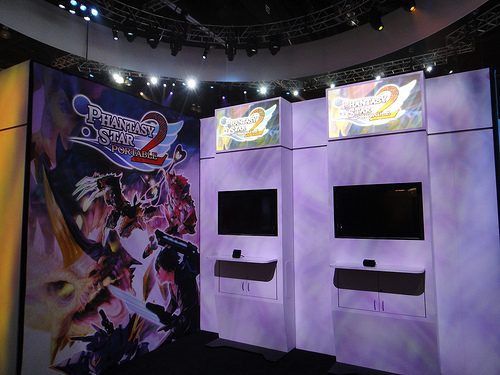 In this space, players can sit down in a Splash Hill Zone-themed area to immerse themselves in the game and the game’s experience. I sat in one of those chairs this morning as I tweeted up the photos, so I can attest that they are comfy. Just outside the lounge is this cool area for photos. I’ve already seen people posing for pictures with Sonic. Either this statue is exactly like the one that’s in our office lobby, or it is the one from our office lobby. Alright, we’re halfway around the booth now. This is the area for Conduit 2, where some fine folks from High Voltage Software are helping us to show off the game. 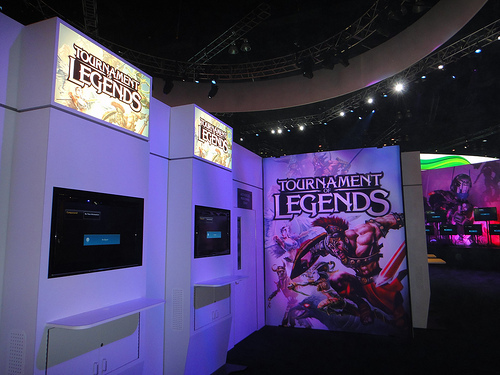 Just behind that is another High Voltage Software game – Tournament of Legends. We’ve got some HVS folks helping out here as well. On the outer edge of the booth, we’ve got some great digital titles. After Burner Climax, Football Manager 2010, Super Monkey Ball 2 Sakura Edition, Crazy Taxi, and Sonic Adventure are all represented here. 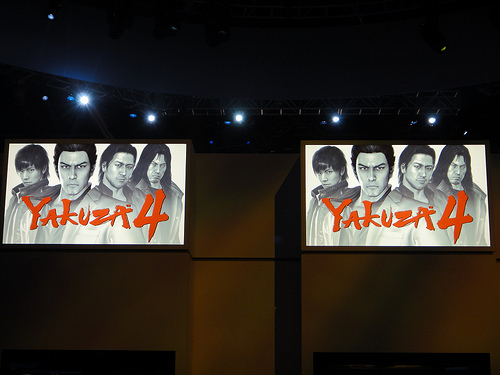 On the inside, a 180 degree turn from the digital games, is Yakuza 4. Just to the right of Yakuza 4 is Phantasy Star Portable 2. 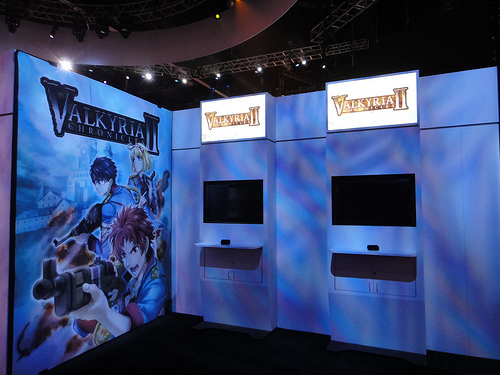 The next place further to the right is Valkyria Chronicles II. 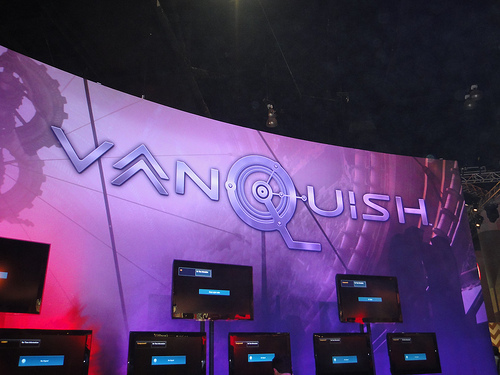 Finally, rounding out our booth is Vanquish. It’s opposite Valkyria Chronicles II and Phantasy Star Portable 2, just next to the digital titles. 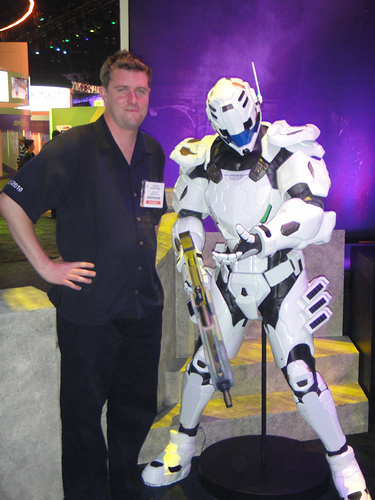 If getting your photo taken with Sonic was not enough for you, you can get your photo taken with the Vanquish soldier, just like ClumsyOrchid did. We’ve got lots more coming over the next few days, so stay tuned! E3 2010 has just begun, and much awaits. YUSSS! Im so excited for all 4 sonic titles! 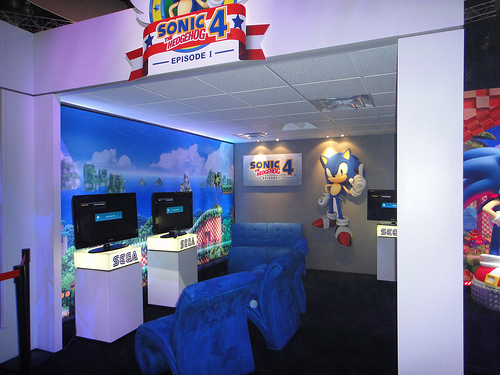 The Sonic 4 area looks very cozy. 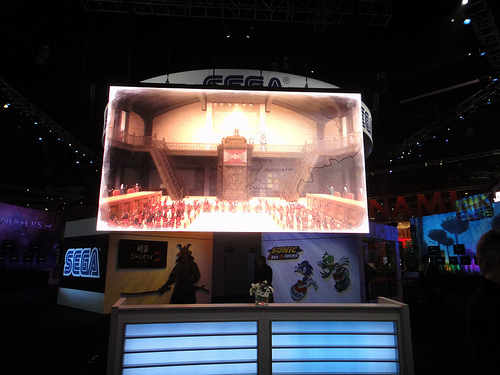 Gotta make your fans comfortable while playing Sonic 4, I guess, lol..
That’s a cool Sega booth, though. Looking forward to more info on your upcoming games. and where is Shenmue 3? I can’t understand why this game ahs no end. Hey where is ALIENS: COLONIAL MARINES. I was very exited to see it. I was hoping Sega would be putting a game with lots of potential over their usual cliche franchises like Sonic. 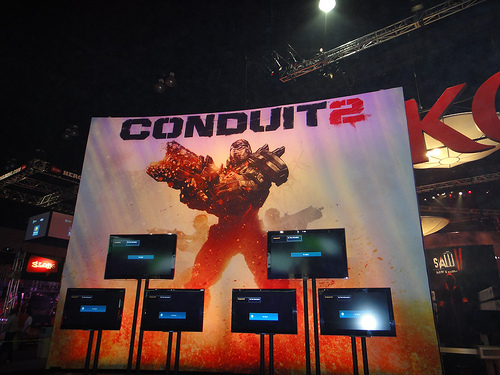 Why havnt we seen ANYTHING on conduit 2 yet? Uhh… Sega I was really hoping that you were going to be showcasing Aliens: Colonial Marines. I am a big fan of those movies and was really looking forward to hearing about that game. Not to mention Gearbox Software is a great developer. I would reeeaaaaaaaaalllllly like to have that Vanquish statue. No new Phantasy Star Online console game? Clumsy — The Sonic statue is still here in the lobby. 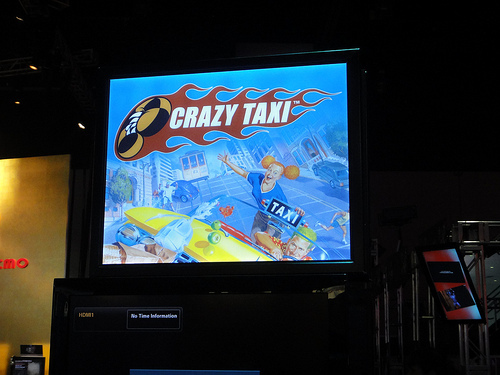 So the one at E3 … is an impostor (!). Or else the one here is (!?!) … that just raises further questions! Hey, Where is Virtua Fighter 5 Final Showdown? JetDog: There’s people who are unable to download Sonic 4. I’m personally looking forward to Sonic 4 and Sonic Colours. 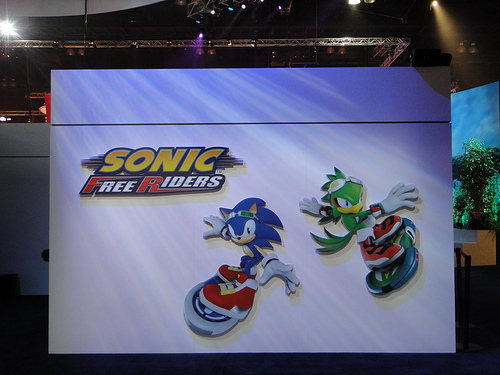 Don’t really care at all about Sonic Free Riders..
@sonicfan: Pardon? I wasn’t saying they should stick strictly to Sonic 4, let alone ragging on Colors. If you mean to imply that you and many others are DS-bound or lacking Internet, and therefore can’t download Sonic 4, I respect that. If anything, I was hoping Sega would make a DS counterpart to Sonic 4, since the design seems to be simple enough. I will admit that the announcement of Sonic Colors caught me a little off guard, especially considering Sega drumming up publicity for Sonic 4 in the meantime. If it’s a quality product, I’m fine with it. What worries me is Sega spreading the franchise thin after claiming they’re committed to it. If Kinect sells like hotcakes — and it very well might — Sonic Free Riders might fly off the shelves as well, considering how well previous Riders have sold. But the Riders series has a checkered history, and it’s insulting that they’re not devoting their time and money to what would likely be a better racing game, a better Sonic game, or who knows what, instead of a new Riders. Sonic is already fast and slick, or so the old games would have me believe, and he needs a hoverboard about as much as Indiana Jones needs Shia LaBeouf. (That means NOT AT ALL, Sega, in case your market research is off.) Hopefully I cleared that up. @Kellie: Thanks for correcting it. RedCoKid – this was entirely my mistake. Can we chalk it up to not enough coffee or E3 brain dead-ness? It’s Super Monkey Ball 2 Sakura Edition. That’s the version of Super Monkey Ball 2 for iPad. And it’s corrected now. @Kellie: Sakura Wars on the PSN would have been so awesome… Sakura Wars: So Long, My Love is great and SRPGs are my favorite kind of games. The new Sonic games are cool,but People wants a Billy Hatcher sequel. I wish I could play new Sonic games on my PC. Although I am just as excited as others for Vanquish (looks realllllllly sickkkk) and Sonic 4, I would really like to hear if there is a confirmed release date for Valkyria Chronicles 2. It would be nice to know when in Summer 2010 we’d see it on retailers’ shelves. 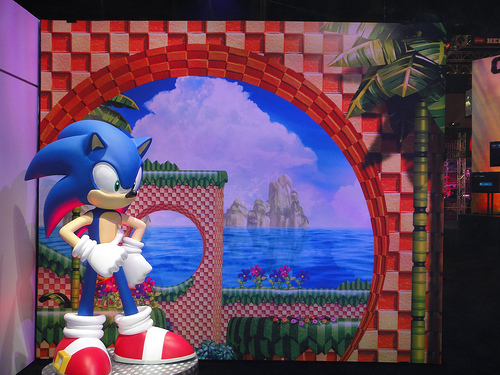 I just LOVE the Sonic 4 and Sonic Colors booths (boy, do i wish I was there right now…but I live in NEW JERSEY! A shame, isn’t it?). You gotta be kidding me… NO ALIENS: COLONIAL MARINES AGAIN?? 3RD E3 IN A ROW SEGA?? THANKS FOR GIVING US A CRAPPY ALIENS VS PREDATOR AND CANNING THE RPG AND NOT EVER SHOWING A:CM. Sega, all we wanted was a teeny tiny glimpse of something Aliens: Colonial Marines. Is that too much to ask from your loyal fans and followers? When and where can we expect to see something? Sorry for annoucing it would be there. Blame gamespot! ………ahh, and in other news, i nearly wee’d at the sight of SHOGUN. Come on SEGA, listen to your fans! Where the hell is Shenmue 3? SEGA!!!!! WHAT IS THE DEAL WITH NO ALIENS: COLONIAL MARINES?! HOW LONG ARE YOU GONNA TORMENT US BEFORE YOU SHOW OFF THE BEST GAME YOU GUYS HAVE IN YOUR ARSENAL!!! IT’S BEEN TOO LONG FOR YOU GUYS NOT TO SHOWOFF THIS AMAZING GAME! PLEASE GIVE ALIENS FANS WHAT THEY WANT AND SHOWCASE THIS AMAZING GAME YOU HAVE IN PRODUCTION!!!!!!! the thing that bothers me is, Sega is re-releasing some DC games.. WHY NOT RE-RELEASE Shenmue 1 and 2 ! if your not gonna go ahead with 3 then try to build something about it let us fans have something!! Hey Sega, where is all the ALIENS goodness you promised a long time ago. How many promises do you have to make before going through with just ONE? How many fans will you have to lose? I am sure not many people like to bash you guys on your own forums and blogs but when you refuse to communicate us and even less, not show the game we have been waiting for years now, I have no disagreement when people start to flame you guys. Sorry Sega, but you have held Aliens: Colonial Marines off for too long. Its time to launch the rocket, Sega and blast the world away with Aliens: Colonial Marines. Sonic got crap when Sega stopped making consoles in 2002, a lot of the games you guys come up with now are average, that’s not the sega i remember, listen to your fans and get on with a masterpiece like Shenmue 3! wow, everyones complaining about Aliens……..
Dengeki Bunko: Fighting Climax Heads West! This site requires Adobe Flash Player 8. Click here to Download Now. SEGA Blog © 2016 All Rights Reserved.